Pepperdecks, the guys behind the original “Djoclate” mini-mixer, have announced their newest prototype, the micro-mixing utility called the “Djoclate II.” Adding headphone cueing functionality, the pocket-sized piece of tech is an interesting addition to the growing line of scaled down mixers on the market. Designed with small gatherings and house parties rather than club venues, the Djocolate II allows for connectivity of multiple devices, like iPods or laptops, and can output via Bluetooth to any Bluetooth-enabled speaker system. It also has dedicated bass kill switches, for transitioning between two sub-heavy tracks seamlessly, full-size faders, and a built-in pre-amp to maintain quality output. 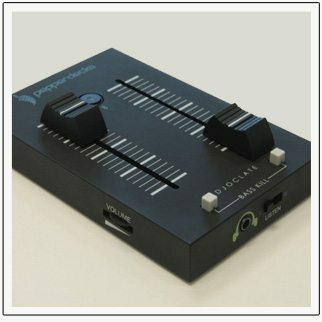 The Pepperdecks creation will retail for anywhere between 45$ and 65$, making it an affordable way of casually DJing/mixing at any local party without lugging around your standard gear. The Djoclate II, however, was quite R&D intensive, and as a result, the team has created a Kickstarter to fund the large-scale manufacturing of the product.